Picture: Member Stephen Gilson (lost 5 stones), Karen Smith and member Denise Spillane (lost 6 stones). In October 2014 I celebrated my 20th anniversary in the fitness industry and boy, were we busy! 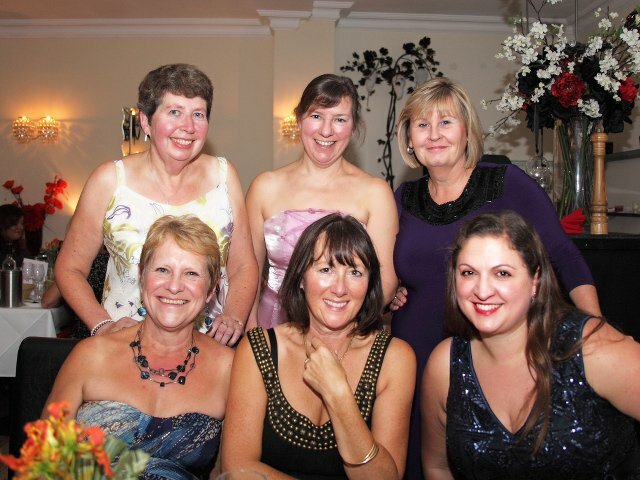 Our first event on Saturday 25th October was a very enjoyable black tie ‘Hollywood’ themed dinner at Morello Restaurant in South Woodford where 60 members and their guests who were all dressed to impress came to ‘dine, dance and donate’. Celebrity photographer, great live entertainment and a fabulous 3-course dinner ensured the evening was a big success. We ran a Hollywood sweepstake with cash prizes and sold raffle tickets throughout the evening with all proceeds going to the charity. The next seven days brought more celebrations. At the end of every weigh in and workout class each member was presented with a (fairly) healthy combination of a ‘Fitgirlfizz’ cocktail and individual cake. On Sunday 2nd November the celebrations came to a close with a two-hour Aerobathon. We saw fantastic support from 80 members plus their friends and family who all came along to workout together. Four instructors delivered a variety of exercise styles including: Combat, Aerobics, FitSteps, HIIT and Pilates. Our members generously donated raffle prizes plus low fat cakes, drinks and snacks, which were sold on the day to raise even more funds. Our raffle was drawn and many members won fantastic prizes, some of which were provided by local restaurants and businesses who were extremely generous in their support. Haven House sent two representatives along to the Aerobathon who explained to us the fantastic work undertaken by the charity. They were absolutely amazed by the support and enthusiasm of the Aerobathon participants as well as being delighted with the total of our fund raising efforts. I was also surprised and delighted to be presented with such wonderful and generous gifts from my members at the end of the event. My first 20 years in fitness have been absolutely incredible, helping so many people lose weight and get fitter makes my job really worthwhile. Here’s to the next 20!